There are times when you have to implement complex, many step decision based algorithms. These are not usually part of the most elegant code you’ll write and you’ll have to be careful and keep you code as clean and as simple as possible. Don’t nest if clauses on multiple levels, split your code in multiple methods, keep your methods short, give them clear, suggestive names. These are some guidelines on how to keep your code manageable, but I’m not going to talk about implementation guidelines here. Instead, I want to discuss another problem I have run into when writing these kinds of algorithms. How do I explain what the algorithm is doing to other people in today’s short-attention-spanned world? How do I make this explanation simple and easy to follow? Also, how do I write a document that is easy to update as the algorithm changes? Now you’ll know if you should eat ice cream by answering the question in the node and following the answer branch to the algorithm result. But it’s not always that easy. If such an algorithm is or becomes more complex, its decision tree grows. Soon, you won’t be able to fit that tree in a single page. You’ll have to split it into multiple pages or screens. Each time a change must be made to the algorithm, you have to find all the places in the tree that are affected and edit them. And have you ever solved a printed labyrinth? This decision tree is starting to look like one, and if you make a mistake along your path you’ll reach some unexpected answer and end up more confused about what the algorithm is doing than when you stated. Do you still want that ice cream? In this post I’m exploring what may be a better way to present your algorithm. Easier to manage than a decision tree and easier to follow by the person reading it. It’s also easy to build as you go over the code of your algorithm. I am referring to a wizard-style presentation. The presentation will have a page for each question you ask. The page also contains all the possible answers for that question as buttons. You read the question, choose the correct answer for the current situation and click the corresponding button. The presentation then moves to the next page, containing the next question or, if you reached the end, the answer that the algorithm provides. This way, one can go over the algorithm step by step and experiment with different inputs to gain a better understanding of how a decision is reached. The presentation shows a single question at a time so it is easy to remain focused instead of being overwhelmed by the labyrinth you still have to follow to reach your answer. In addition to showing the current question, you can also keep all previous questions on screen and highlight the answers that were chosen. If you do this, once an answer is reached, the reader can look at all the previous steps and review the path that brought them to that answer. This presentation approach is just a tool to help one understand how a complex algorithm works without having to look at the implementation. I think this is a good alternative to a decision tree, easier to follow and also easier to maintain. The function highlights the button that was clicked, disables all buttons to prevent users from clicking them again and makes the next step visible. We also have a reset function that can be executed once an answer was reached. This function will bring all steps and buttons to their original state. For more details, see the source of the demonstration section of this page. Now you have a practical way of figuring out if you should eat that ice cream. Try it out! 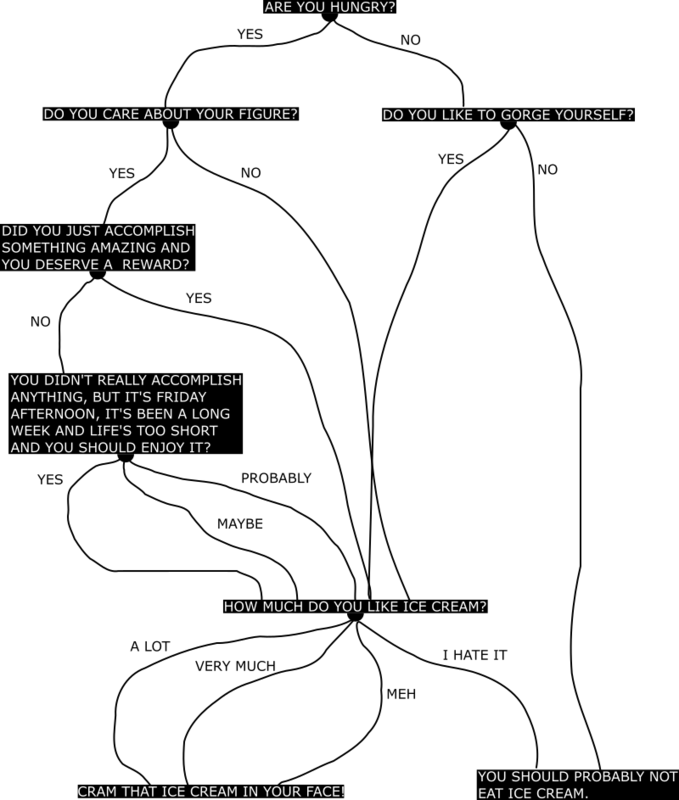 Do you care about your figure? Did you just accomplish something amazing and you deserve a reward? You didn't really accomplish anything, but it's Friday afternoon, it's been a long week and life's too short and you should enjoy it? Do you like to gorge yourself? Cram that ice cream in your face! You should probably not eat ice cream.